April brings National Volunteer Week to North America and other regions have similar celebrations coming up in the next few months. Several titles in our bookstore are especially nice for volunteer recognition. Have fun at your volunteer recognition event! Seven original skits complete with instructions, complete scripts, song words, and ideas for adaptation (no real talent needed!). Ten keys to recognizing volunteers, with a list of lots and lots of actions you can take to say thank you. Learn more about the principles of recognition and ideas for thank-yous that volunteers will like in the Recognition topic of our A-Z Volunteer Management Library. Our colleague and friend, Betty Stallings, has spent decades as a thought leader for the volunteer engagement profession. She will be "stepping aside" (her words) from the field in July, no longer traveling for speaking engagements or producing resources for the field. As a parting gift/legacy, she is offering generous discounts on licenses to update, re-brand and utilize many of the materials she has written, particularly her terrific Training Busy Staff to Succeed with Volunteers: The 55-Minute Staff Training Series. The license gives you permission to own, adapt and widely share these unique internal training modules throughout whatever network you wish, whether local, regional, state or national. Save hours of time by starting with her curriculum and slides to develop your own internal training with your branding. The Series has already been licensed to numerous state and national organizations - with great success. Licenses for her books, Leading the Way to Successful Volunteer Involvement: Practical Tools for Busy Executives and How to Produce Fabulous Fundraising Events: � Reap Remarkable Returns� with Minimal Effort can also be negotiated. Betty's desire, in this transition, is to provide organizations an opportunity to build on existing volunteerism resources and move forward, not waste time reinventing what is already available as a starting point. To discover if a license opportunity could provide your organization with great resources, contact Betty at BettyStall@aol.com to arrange a time to explore what amazing offers await you. No pressure (her words)...just a brief chat to see if this would advance the mission of your network. Volume XV, Issue 2 of e-Volunteerism, our international, subscription-based journal for informing and challenging leaders of volunteers, will run through mid-April. 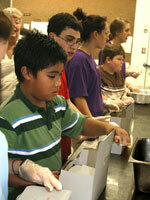 Teens with Autism Show that Volunteering Is for Everyone (VIII, 1, 2007) - Read how the Southwest Autism Research and Resource Center in Phoenix, AZ, gives teenagers with autism the opportunity to volunteer, to experience the chance to give back to their community. "Is There a Template I Can Use? " and Other Questions Asked Too Often - Overworked volunteer resources managers often look at what others seem to be doing successfully and then use those practices or templates for their needs. Susan J. Ellis and Rob Jackson caution against this one-size-fits-all approach and offer ways to customize rather than copy available models. Calculating an Organization's Social Return on Investment in Volunteers - Laurie Mook reviews research presenting a way to measure the social returns on investment in volunteer recruiting, training, and management. Volume XV, Issue 3 will open on April 15th. Look for the usual variety of articles, including an exploration of the limits of "benchmarking" as a way to evaluate volunteer programs, how loving your job is the key to successful volunteer management, a new research review, more training tips, and more. As always, the articles in all past issues remain accessible (and open to reader comments) in the online Archives. Last month I published a Training Design in e-Volunteerism on how to generate more valuable exchange among adult learners during a session. I thought the following excerpt of the article might be useful to everyone. Sometimes we need to talk about difficult or controversial subjects. Lecturing does not permit learners to share their reactions, but even small group discussions can be awkward or embarrassing. But it is vital to allow concerns to surface. Not talking about uncomfortable or controversial subjects simply keeps them secret and they become a barrier to new learning. So here are a few ways to surface true feelings while providing safety to all learners. Distribute index cards or small sheets of paper; make sure they are all alike so no one can identify one from the others. Now, pose a difficult question, such as: If you could change one thing about the system we use now, what would it be? What do you think is the least successful activity we run? Why do you think this problem has surfaced now? Ask everyone to respond silently by writing responses on the index cards or sheets of paper. Collect all the papers in a big hat or bag, shake them up, and redistribute them, letting each participant pick one out. This means everyone is holding someone's response, but everything is anonymous (if someone happens to pick their own paper by accident, all they have to do is not tell!). Now go around and ask each person to read the response on the paper they just picked. Record the responses. You will quickly realize that patterns emerge. I have done this exercise often and invariably it turns out that negative opinions are shared by others. Individuals think only they feel this way and so do not speak up; discovering that their opinion is valid permits real discussion to begin. Conversely, if someone is "sure" they speak for the majority, this exercise may show that more people have an alternate viewpoint. Ask each participant to draw something that conveys what each person thinks about a subject. This is not an art contest and no one is judged on how they draw! Stick figures are just fine. Allow five minutes to create the image and then ask everyone to explain what they drew and why. I have used this exercise several times to make a group aware that they do not all "see" their organization in the same way, and therefore their ideas for future planning are not in synch. So I instruct them to "draw a picture of how YOU see this organization - something that represents it to you in imagery." As everyone shares their drawings, the lack of consensus becomes clear: a shaggy dog straining on a leash; a kite flying high in the sky but people struggling to keep it from flying away; a storm cloud with lightning; smiling stick figures holding hands in front of a burning building; a Christmas tree with presents. Some elements are positive, some not. There are also common denominators, and those lead the way to greater agreement on what everyone wants the organization to look like as it moves forward. When an issue has two or more clear sides or directions that might be taken, break into subgroups by chance (not by who believes what). Each group is tasked with generating a list of arguments or discussion points to make their case. Even if someone feels the exact opposite, it's still possible to articulate that the other side might say. Each buzz group then selects a representative spokesperson who will come to the front of the room and face a representative of the opposing view. Both use their groups' list of points to argue their side. If you have a large group, still only allow two people to debate at a time; stop them after a few minutes and replace them with another two representatives who pick up where the discussion left off, and so on.